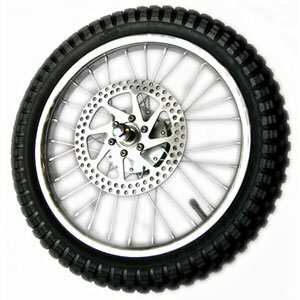 Authentic OEM Razor Front Wheel Assembly for the Razor MX500 and MX650 Dirt Rocket. Includes 16"x2.4" knobby tire, inner tube, wire spoke wheel, disc brake rotor, and axle. Includes: 16"x2.4" knobby tire, inner tube, wire spoke wheel, disc brake rotor, and axle. This wheel comes in a Razor Factory Sealed Brown Box with Two Razor Stickers and Amazon Barcode affixed to the carton. This product is an OEM Razor Factory Part #W15128190049. If you have any questions about this product by Razor, contact us by completing and submitting the form below. If you are looking for a specif part number, please include it with your message.